“Nuclear HeartlandUSA” was published to “Social Justice in the Heart of Berkeley” You Tube Channel on March 29, 2017 by Vic Sadot. 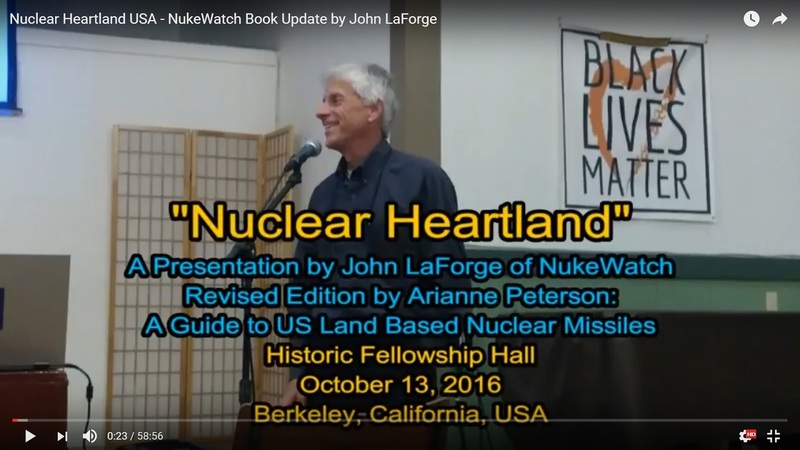 Nuclear Heartland, the book, was first published in 1988. 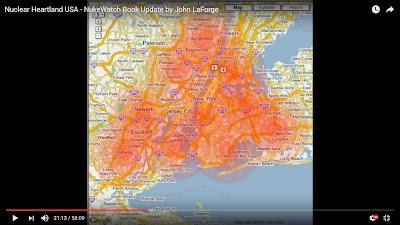 John LaForge of Nukewatch updated and republished a 2015 report on the status of land-based nuclear silos in the United States. He presented a power-point lecture on the book and the nuclear weapons abolition movement. 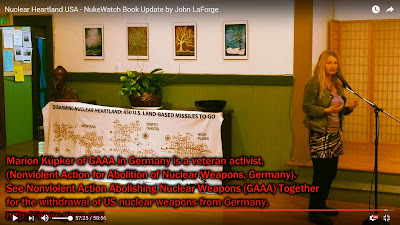 John LaForge of Nukewatch was accompanied on this speaking tour with German nuclear abolitionist activist Marion Küpker, who represents GAAA, Gewaltfreie Aktion Atomwaffen Abschaffen (GAAA, Nonviolent Action to Abolish Nuclear Weapons). 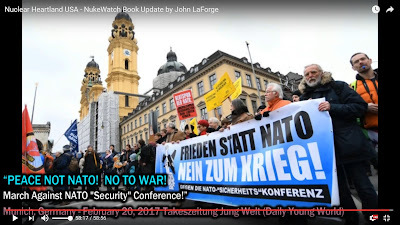 It is a German organisation dedicated to the total abolition of nuclear weapons. 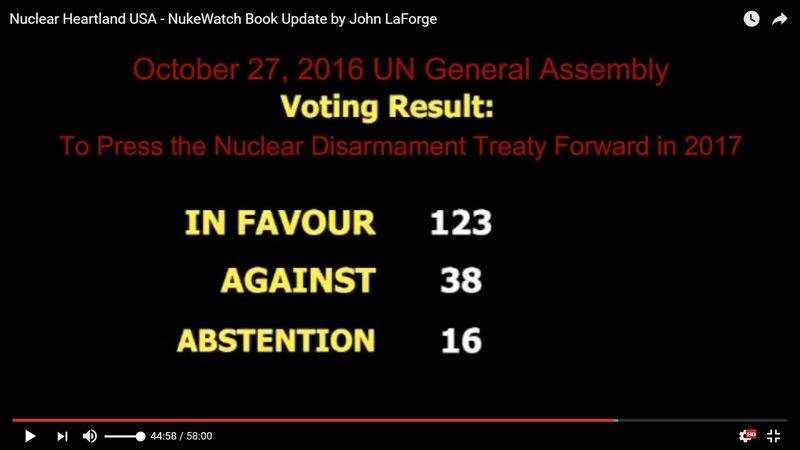 Since many of us had not heard that a historic vote in the UN General Assembly was coming up on Oct 27, 2016, we learned about it from John LaForge. 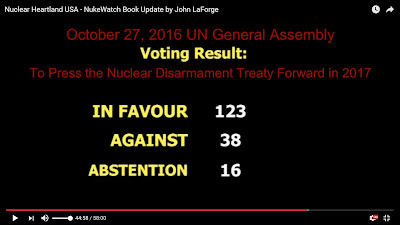 The vote was overwhelming to make 2017 the year to push the Nuclear Non Proliferation Treaty forward through UN sponsored conferences: 123 In Favor; 38 Against; 16 Abstentions. The vote was something of an act of defiance toward the Security Council, and almost all nuclear-armed powers voted no, with some notable abstentions. The mainstream media buried the story as if it was not a significant event in human history! Cynthia Jean Johson welcomed everyone to Historic Fellowship Hall in Berkeley. Author-activist Cecile Pineda did the introduction of John LaForge of Nukewatch. BFUU Social Justice Committee activists Ingrid Kepler-May and James Beatty appear in the Q&A session. Ingrid Kepler-May is in the Q&A segment at around 49:10 of the 58 minute video. She is in a discussion with speaker John LaForge about the effects of US use of depleted uranium in weapons and armor, particularly how it contaminates the environment and causes birth defects in Iraqi babies. Ingrid witnessed these results first-hand on a visit to hospitals in Iraq. 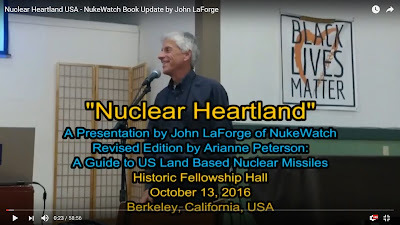 The 58 minutes video was made by Vic Sadot from an audio recording by David Yandle of a John LaForge NukeWatch Book Update presentation by John in Fellowship Hall, Berkeley, CA on Oct. 13, 2016. Sponsored by BFUU Social Justice Committee. The vote was presaged by John LaForge on Oct 13, 2016 in Berkeley. 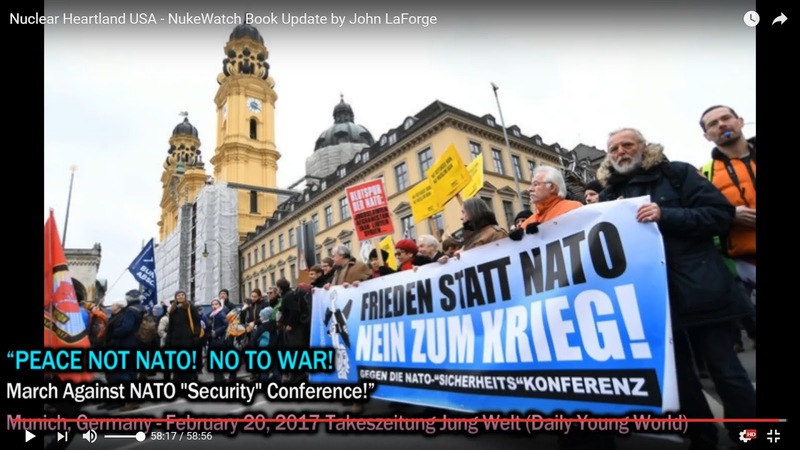 We include that with the advantage of releasing the video in late March 2017 as the US, UK, and other nuclear powers were actually boycotting the talks, and instead planning new attacks on Syria, and blaming the Russians for hacking the last US election. 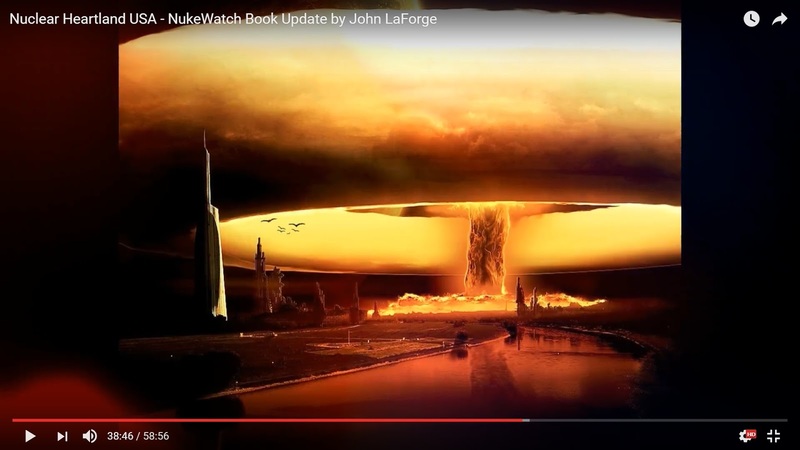 Did your media even cover the crucial talks to ban nuclear weapons from the Earth? Next round is in July! Make them negotiate nuclear disarmament like they were doing before GW unilaterally withdrew the US from the ABM Treaty with Russia! Making the Middle East a Nuclear Weapons Free Zone is one of the immediate goals of many nuclear abolition activists. 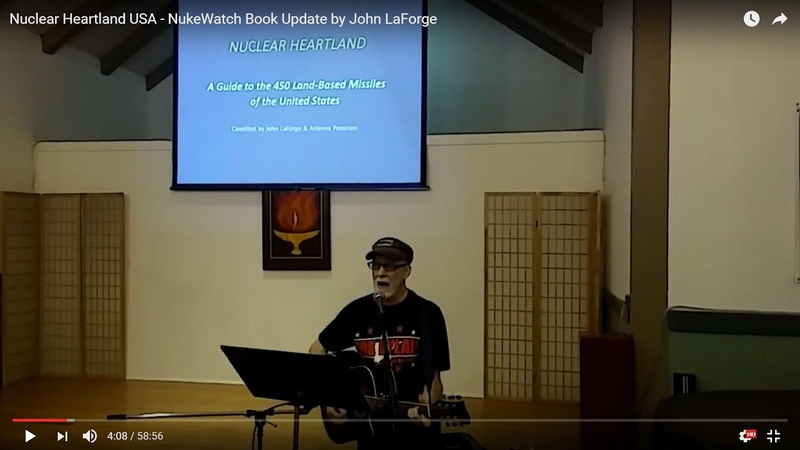 It was a stunning and memorable update presentation by John LaForge to celebrate the 2015 re-publication of “Nuclear Heartland”! 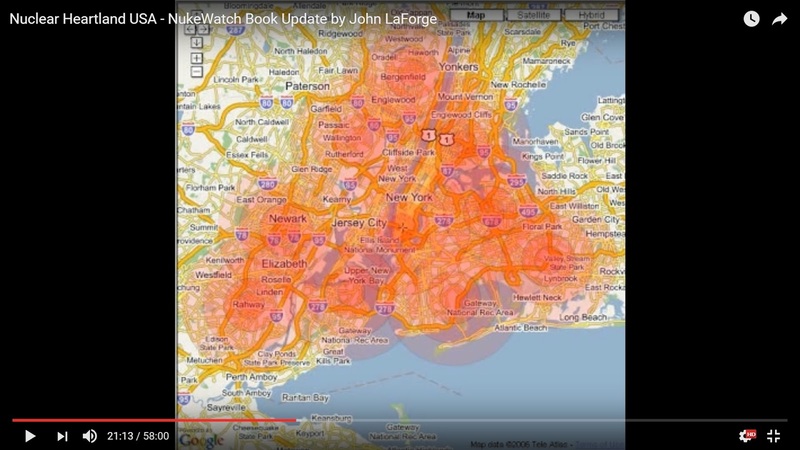 The book was first published in 1988 to let Americans know where the nuke silos are, and that they make you less secure in contradiction of the stated nuclear “deterrence” goal. This only becomes apparent after you understand the war profiteering and the unacceptable risks involved in nuclear radiation, and the climate of fear needed to promote the arms race. Vic Sadot performing Bob Dylan's "Masters of War"
Can you help to get this video seen and heard? The format is based on the usual Public Access Cable TV requirements. Anyone can download and use this video under Creative Commons Copyright with accreditation and non-profit educational use. Can you forward this to someone who does that? Or can you be the person to make that happen in your community? If so, thank you!